OAI's Development of a Suburban Wellfield, see Case #4 below. 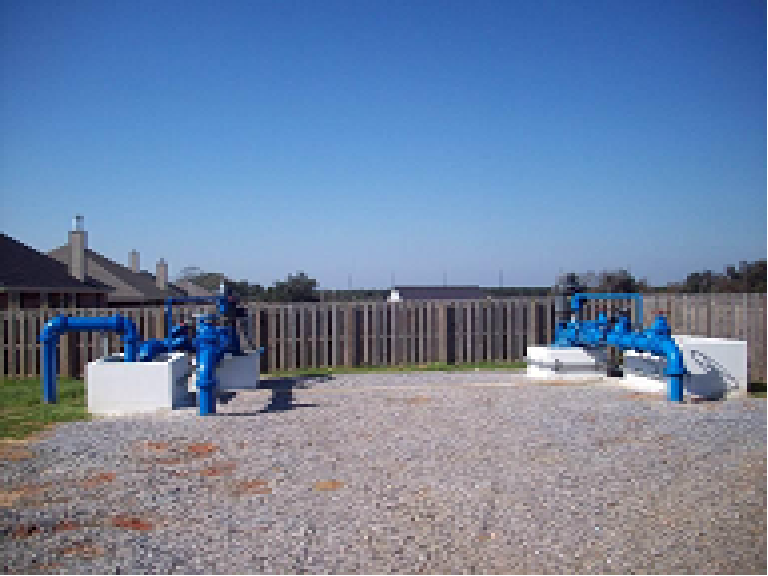 OAI's direct* involvement with the development of groundwater for public supply purposed began in 1999 with the planning, testing, development and permitting of a municipal wellfield for a Baldwin County water system. In all, since that first call, OAI has completed 90+ hydrogeologic studies that have resulted in the development of 51 public supply wells capable of producing 47+ million gallons per day. The following case studies highlight some of these public supply well projects. This Baldwin County utility was first introduced to OAI's hydrogeologic approach to the development of groundwater resources after four dry holes and two test wells resulted in the completion of a single 600 gpm production well. Since switching to OAI and implementing OAI's approach, the system has completed two single aquifer wellfields and one multi-aquifer wellfield with the addition of four public supply wells. The four wells increased production by 3,350 gpm (4.8 mgd) with no test wells or dry holes. This Dallas County water system was in dire straits due to the 2007 drought and were several months into water rationing which in turn brought lower revenue. Their solution to the drought was to drill a new 1,450+ foot deep well. OAI was retained to complete a hydrogeologic study to determine whether or not the target aquifer was present at depth. The study found that not only was the aquifer present at depth, it also found that forty years earlier the system completed a test well in the aquifer and found that the targeted aquifer contained high quality water eliminating the current budgeted cost for a new test well. More importantly, the study showed that by simply lowering the pumps in two existing wells by 50 feet, these existing two wells would provide an adequate supply of water to the system for many years to come. This $50,000 fix eliminated the current need for the new $1,000,000+ well, provided an end to water rationing and restored their revenue stream. This southwest Alabama water system completed a test bore and dry hole in an area of their system where they needed additional supply. OAI was retained to review the work to date and identify options for developing an additional supply. The review was successful in identifying distribution problems a new well would bring and outlined a plan to expand production without a new well. Testing confirmed the feasibility of OAI's plan and the system implemented the plan that maximized production under the existing distribution network. This Mobile County water system was in need of a new well. Working with the system's engineer, OAI was called on to provide hydrogeologic planning and wellsite services for the new well that was an offset to an existing well. As the pilot bore was advanced, OAI identified a sand not previous under consideration for development. Based on OAI's observation and recomendation to test the sand, the single well location was developed as a multi-well multi-aquifer wellfield. The primary aquifer tested out at 1,276 gpm and was permitted for 850 gpm. The secondary aquifer tested out at 900 gpm and was permitted for 600 gpm. The wells, seen at the top of the page, are 41 feet apart horizontally and located in the "back yard" on a residential lot with the treatment plant designed to look like a residence in the subdivision. Savings to the water system on this multi-well project were estimated at $600,000. * Does not include 5 years of groundwater development experience prior to forming OAI.